A week ago our beautiful baby girl was christened at the same church where Izzy was christened and where we got married last year. Izzy enjoyed dressing up for the occasion in her party dress, and insisted that she wear her christening bracelet as Clara was wearing her’s. She even made up a little song for her sister, “Happy Christening Day”, sung to the tune of Happy Birthday. 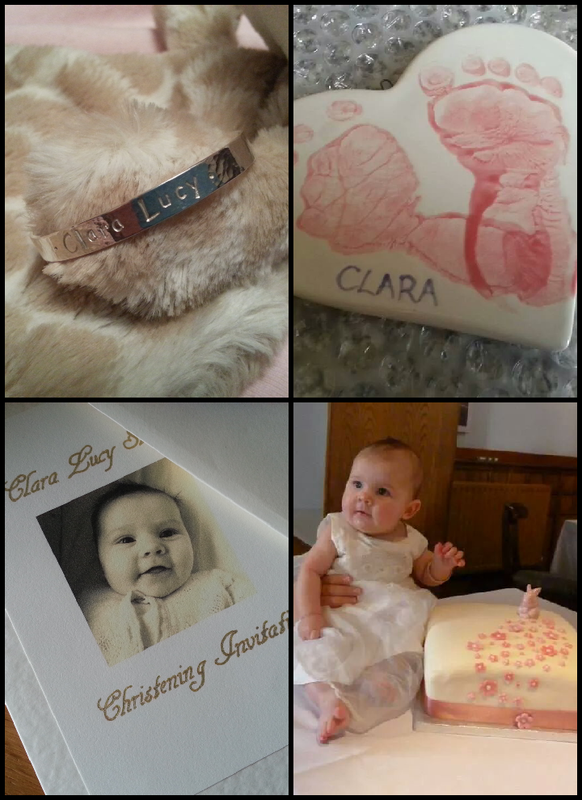 Clara wore Izzy’s christening dress, which fit despite being size 6-12 months, and we had her silver christening bracelet made and personalised with her name and the date of the christening, from Etsy. I enjoyed adding some personal, handmade touches to the day. For her two Godmothers we went to a local craft shop and printed her two tiny feet on a heart shaped plaque as a nice keepsake. I made the invitations and cake myself, using a small ceramic rabbit from Not on the High Street as a cake topper. Of course the highlight for Izzy was tucking into the cake. Having cut some bits of cake off the sides to make it smooth, I then found her sneaking some out of the bin! “You do not eat food out of the bin” is not a phrase I thought I would ever have to say. Same with “You do not eat food off the floor” as after our lovely Sunday dinner following the christening, I found Izzy eating a roast potato that she had found on the floor of the restaurant. You would think she never gets fed.